Change—and the innovation it creates—increasingly defines the winners and losers in today’s manufacturing industry. As successful manufacturers continue to embrace the Internet of Things (IoT), Industry 4.0, and other digital transformation trends, it’s important to recognize and implement these changes or risk getting left behind by the competition. 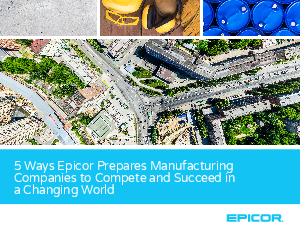 We’ll also explain how Epicor Cloud ERP equips manufacturers to regard change as an opportunity rather than a threat. Download the eBook to learn more.